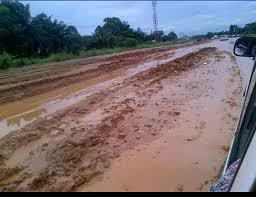 Until you take a drive through the many cities and villages across the length and breadth of Nigeria, you may not be able to truly appreciate the deplorable condition of our roads. People who primarily reside and work in the Federal Capital Territory may never be aware that in certain parts of the country, there are practically no roads. What might pass as roads which people drive on are simply old and terribly dilapidated and almost totally unpassable. There are many farming communities and villages all across Nigeria and some of these places have the capacity to feed the Nation, if the right infrastructure and social amenities are put in place. Due to the current economic hardship and the thinning of Nigeria’s foreign exchange earnings arising from the global slump in oil prices, the government has tried to encourage young people to embrace farming as a way to get jobs and get out of poverty. The reality today is that the unemployment rate in Nigeria is at its highest compared to anytime in recent history. It ought to be obvious that farming is a viable alternative. But it doesn’t appear so because in the minds of young people, sending them to the farms is the equivalent of sending them back to the villages and extreme poverty. Some of these young people have parents who farmed to send them to schools. They also understand that the reason why their parents worked so hard in the farms was to give them a life much better than theirs. Imagine how your parents will feel or what they will say if you returned to the village and told them that you would like to be a farmer. They might just even die of cardiac arrest because they will think their son or daughter has been bewitched. It is obvious that simply just asking young people to go into agriculture without the requisite technological and infrastructural base will only fall on deaf ears. If it likes, the government can sing the song about getting back to the farms every day. Government may even decide to spend billions of naira on paid adverts in order to convince people to return to farming. But in the end, only a few people will understand and venture into agriculture. The rest people will simply just sit down and hope that a miracle happens. You might be able to understand it better if you knew how much importance people attached to their degree certificates. As a matter of fact, many people find it totally demeaning and insulting when they are told to go into farming. The most important issue is how the government can make farming attractive to young people. Since it is clear that government is unable to provide jobs to the growing youth population, it is not enough to simply expect the private sector to create the jobs. But government at every level ought to create necessary frameworks and structures that can support the plan. Government must build necessary infrastructure in the villages and communities where people farm. There is no use farming if there are no roads and means to transport the farm produce to places where people can buy them. In many cases, a lot of the things that farmers produce in the villages are wasted as there are usually no means to transport them. This is also the reason why many farmers engage in subsistence farming just to take care of themselves and their immediate families. For as long as government is unable or unwilling to invest money in constructing adequate road networks, the plan to return people to the farms and diversify the economy will remain a tall dream. Government must invest in social amenities or create a structure that will encourage people to do it. When you ask people to return to the villages to farm without providing schools, hospitals, portable water, etc, you are sending them to poverty and suffering. These people need to send their kids to schools and good hospitals. People in government must understand that a lot of these young people are from rural and farming communities and villages and they know the state of social amenities prevailing there. Primary and secondary schools in the villages are in deplorable conditions while the health centres are better described as death centres. With this understanding, it must be clear that nobody in his right mind will return to the village to farm when it is clear that they are being sent to suffering and misery. Government must invest in processing factories. It is not enough to ask people to return to the farms. People have been farming for as long as Nigeria has existed but they are still in poverty. It must be clear that nobody becomes rich simply by farming. Amongst other things, farming will be more attractive and lucrative if people had access to processing factories. For instance, if people knew that there was a garri processing factory, they might be more interested in planting cassava. In places like Benue, they have enough mangoes that can feed the whole of Africa but nearly 90% of the mangoes produced are wasted because there is so much mangoes people can consume at a time. Adequate training to farmers. Farming is not just about planting a crop or rearing chickens. Clearly, to make it an occupation you might enjoy and also make money from it, you will need to be adequately trained and equipped on the different types, techniques and challenges in farming. The reality is that people can only accomplish as much as they know. The techniques for making money from farming must be learnt. People can probably just self-study but this will not accomplish much as there must be government-funded schemes that provide the tools people need to enter agriculture. Financial incentives. It is clear that subsistence farming will not take anyone anywhere. People who want to go into farming must be ready to write simple business plans in order to access government-supported agricultural loan facilities. Till date, there are a few CBN interventions for farmers but the process to access them is usually difficult. This discourages many people from even trying. Government deliberately needs to make these financial incentives more readily available to would-be farmers. Providing improved seeds. It is not enough to send people to the farms. Government must make available improved seeds to guarantee better yields and harvests. It is important that government provides access to fertilizers and other inputs required to generate bumper harvest. Creating a middle-market and off takers. It is important that we create a system where people have the capacity to process farm produce in commercial quantity either for local consumption or for export. This ensures that there is a ready market for whatever people produce. But this will only be possible if there are roads to these farming villages. Martins Itua is the founder/CEO of Financial Freedom Ng. He is a banker, Financial planning and Business advisor. He is on a mission to inspire entrepreneurs to take control of their financial future.